Our lives tell a story. Often, though, we wonder, Is this all there is? What if there’s more? Perhaps, we question, Am I even worthy of a better story? We invite you to journey with us as we discover how God’s redemptive work creates significance in our lives. Finding meaning in our own story is a process. And it begins with a step into the unknown as we trust God to be the Author of new chapters. Turning the page from fear to freedom is possible. We can experience redemption and lead others into their own stories of transformation. 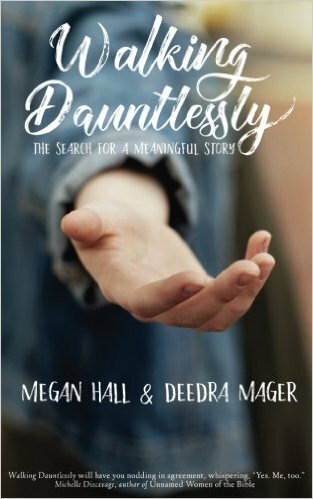 Megan Hall and Deedra Amsden Mager have written women a permission slip. A permission slip to share their story, to bring hurt, pain and shame out into the light so they no longer hold them hostage. You'll read how these two women have come walk in freedom and the vision they have to help other women do the same. We all have a story but we haven't all shared our story. If you've been waiting for something to give you the nudge you need to tell yours, this is it. Be on the lookout for great things to come from these two authors and ministers of the love, grace and healing Jesus offers. Aurora Gregory, author of Amazon Bestseller, "Get Picked"